Click on My Library Account. You will then be presented with a Login screen. Enter your @umail.ucc.ie Email address in the first box. Enter your Student IT Password in the second box. Your UCC Student IT Account is the personalised account given to you at registration. You will need this for the services outlined on the Student IT Services webpage. IT Services staff can help you with any problems at the Help Desk in the Boole Basement near the Lecture theatres and at the Library & IT desk in the Boole Library. Why do you need a Library Account? You must create a PIN on your Library Account yourself. Enter your name in the first box, (Surname is sufficient). Enter your Staff / External Reader number in the second box. 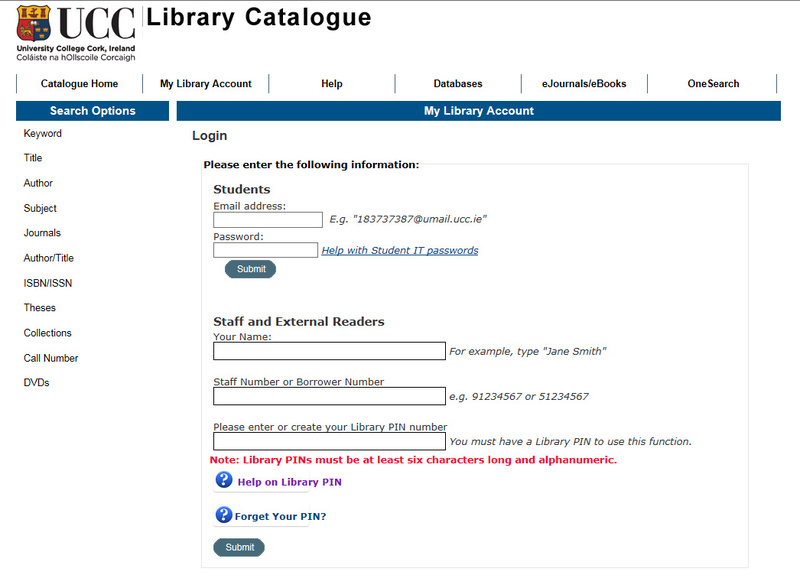 (External Readers can only access their library account, not online resources). When creating a new PIN do not enter any information in the PIN field, but press the submit button. You will be presented with a new screen with two fields to enter and set your PIN . Your PIN needs to be at least 6 characters long and alphanumeric (a combination of letters and numbers) and something that you'll remember. Enter your PIN in both boxes and press submit. Your library account should now open. Click Forgot your PIN? This will send an email to the email address on your library account. For staff it is your UCC email account. For all other users it is the email address provided when setting up accounts. If you have any difficulty with your PIN, contact the Library & IT Desk.